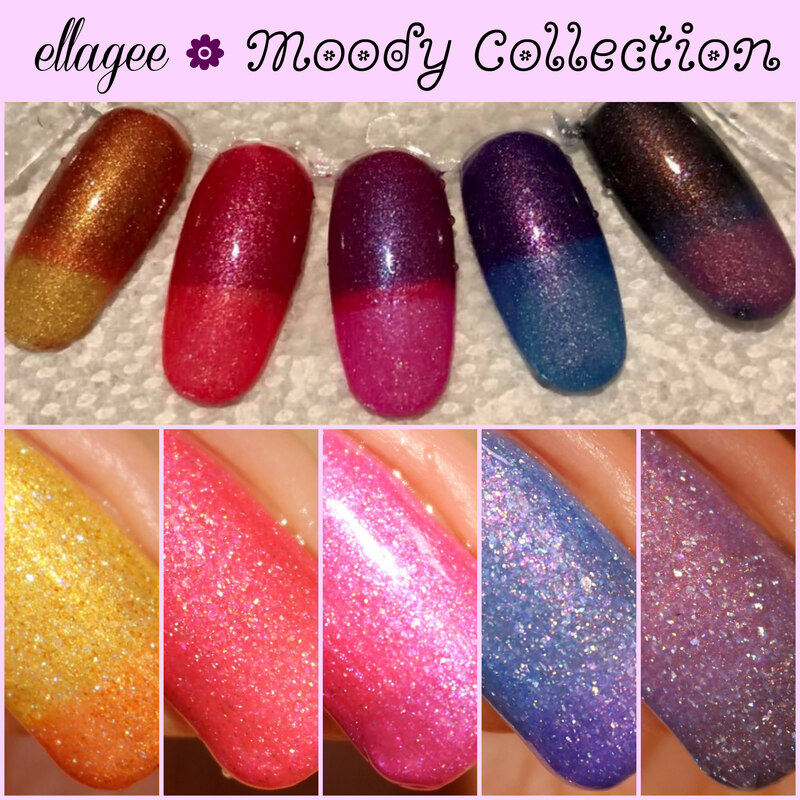 ellagee Moody Collection: The Indie Shop Exclusives! Do I have a treat for all you lucky people that will be attending The Indie Shop in San Antonio this Saturday! Laura, the creative mastermind behind the brand ellagee has created a set of beautiful thermals that are exclusive to the show. Called The Moody Collection, there are five shades to suit your fancy, and I have the pleasure of sharing them with you today! My set was unfortunately damaged by the heat in shipping so you won't have the full thermal range, but you can at least get a glimpse! All polishes are shown with three coats plus top coat. A tri-thermal that is medium pink when warm and violet when cold with a bright cherry pink in between. The lovely thermal effect is enhanced with flashes of hot pink and blue plus rainbow iridescent and holographic microflakes. A tri-thermal that is golden yellow when warm and burnt orange when cold with a bright orange in between. The lovely thermal effect is enhanced with flashes of gold and copper plus rainbow iridescent and holographic microflakes. A tri-thermal that is light periwinkle blue when warm and purple when cold with a vivid blue in between. The lovely thermal effect is enhanced with flashes of blurple and pink plus rainbow iridescent and holographic microflakes. A tri-thermal that is light warm pink when warm and medium warm pink when cold with a coral red in between. The lovely thermal effect is enhanced with flashes of gold and violet plus rainbow iridescent and holographic microflakes. A tri-thermal that is purple when warm and charcoal grey when cold with a deep blue in between. The lovely thermal effect is enhanced with flashes of pink and copper plus rainbow iridescent and holographic microflakes. The swatch stick photo above the nail swatches shows what these thermal polishes are supposed to look like. While they certainly are a lot of fun to play with, they are sensitive to extreme temperature fluctuations, hence my damaged press samples. In an effort to ensure ellagee customers receive the desired thermal change, Laura has decided to make this exclusive to show goers to The Indie Shop in San Antonio. This way you can be confident you are getting quality product. Will you be attending The Indie Shop this weekend? I'd love to hear what all is on your shopping lists! What a cute, sparkly collection! Giggly is my favorite! I love a fun pink polish! How pretty and how lucky the participants of the show are to have the chance to get these. These are so bright and fun. Total summer vibes! Mellow and Giggly are GORGEOUS! Its a pretty collection, even without the full range of color shift. I LOVE that yellow tri-thermal, it looks like a gorgeous ombre!